Hiya guys! I have more swatches for the November Polish Pickup starting up this week. Hasn't the month just flown by?! I have barely managed to save up for this round and it's going to be a killer. The theme voted on was... Fandoms! Like I said... it's going to be a wallet killer haha. Today I'm sharing swatches for Contrary Polish November contribution to the Polish Pickup Collaboration. Let's go ahead and get to the swatches! 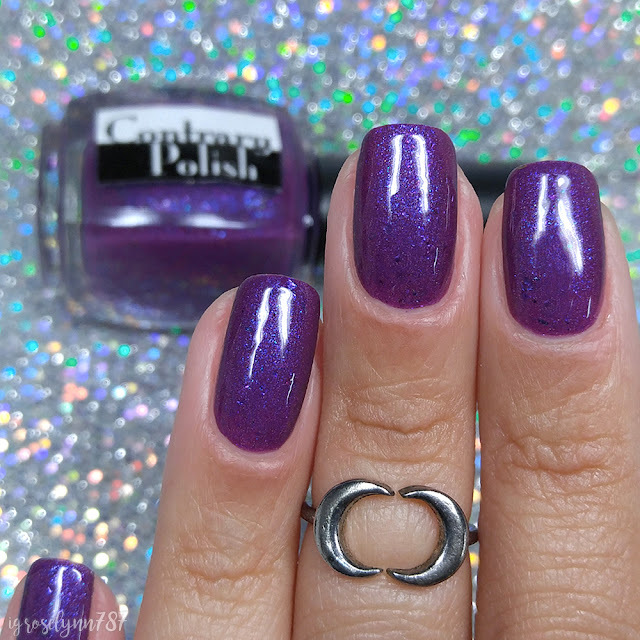 The Juice Fiend by Contrary Polish will be available for purchase through the Polish Pickup Shop November 3rd at 11AM EST through November 6th. This full-size 15mL shade will retail for $12 each. If you're not familiar with the concept, the Polish Pickup offers a fun, interactive experience that allows you to submit theme ideas, vote for your favorite theme, and selectively purchase your favorite polishes every month. As I mentioned before, the theme that was voted for November was Fandoms! Inspired by man-child Buster Bluth on Arrested Development and his passionate love of juice. The Juice Fiend can be described as a grape polish filled with various multichrome pigments (main shift being bright purplish blue to red/pink), multichrome flakes (blue to purple to red to gold), and holographic sparkle. The formula has a sheer application, but builds-up really nicely for full coverage. Nice balanced consistency throughout, neither too thick or too thin. There is plenty of flakies in each brush stroke without overwhelming the nail. Subtle and beautiful! It dries down to a smooth finish despite the flakies. I experienced no staining on removal to either my cuticles or nail beds. Shown here in three coats and sealed with a glossy topcoat. To recap, The Juice Fiend by Contrary Polish will be available for purchase through the Polish Pickup Shop November 3rd at 11AM EST through November 6th. This full-size 15mL shade will retail for $12 each.